I was tempted to make myself a double espresso, post a picture of it, and call it a wired night, but then Amy put me to shame on Tuesday night when she invited me to a delicious dinner at her apartment — read her post and weep with hunger and jealousy. So I decided to take my espresso idea up a notch and make Ina Garten’s espresso ice cream. On her show, she is away for the evening so she makes Jeffrey a quart of espresso ice cream and a full batch of beef stew so he doesn’t go hungry, what a lucky guy! 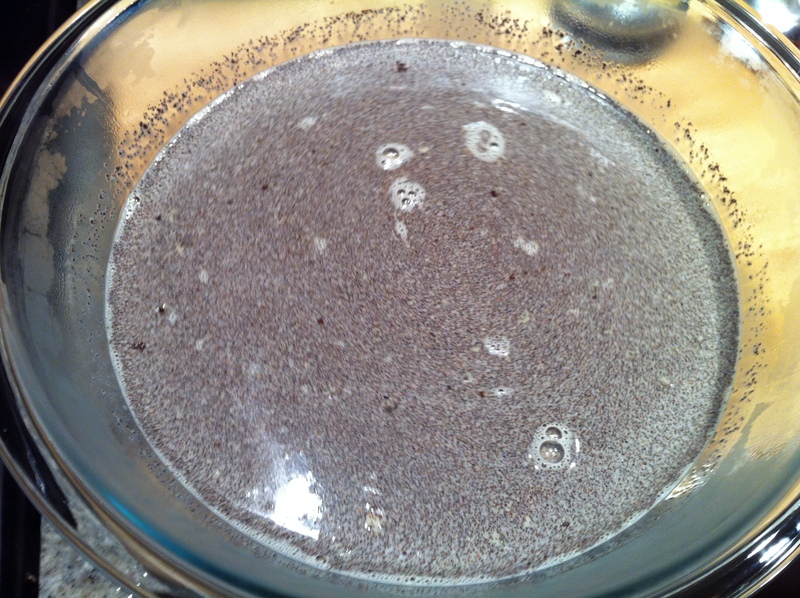 Heat the half and half in a medium sized pot until it bubbles slightly at the edges and steam begins to rise. 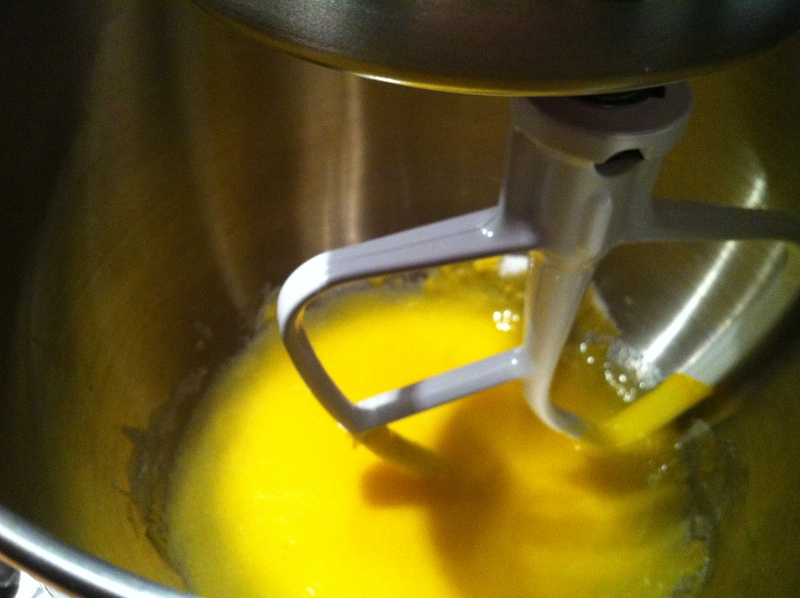 Meanwhile, in the bowl of an electric mixer fitted with the paddle attachment, combine the egg yolks, sugar and salt. In a slow and steady stream, add the hot half and half to the egg/sugar mixture with the mixer running on low. Rinse out the pot, and then transfer the egg/sugar/half and half mixture back to the stove. Cook over medium low heat until it thickens slightly. If you see any visable chucks in your custard, you will want to run everything through a fine mesh sieve. Mine looked pretty smooth so I transferred it directly to a bowl. Add in the ground espresso, coffee liqueur, and vanilla and stir to combine. Cover with plastic wrap — if you put the plastic wrap directly on the surface of the custard it won’t develop one of those foul “skins” when it cools. Pour the cooled custard into the bowl of an ice cream maker, and churn for a good 30-45 minutes until it solidifies somewhat. THEN at the last second, add the chopped espresso beans. 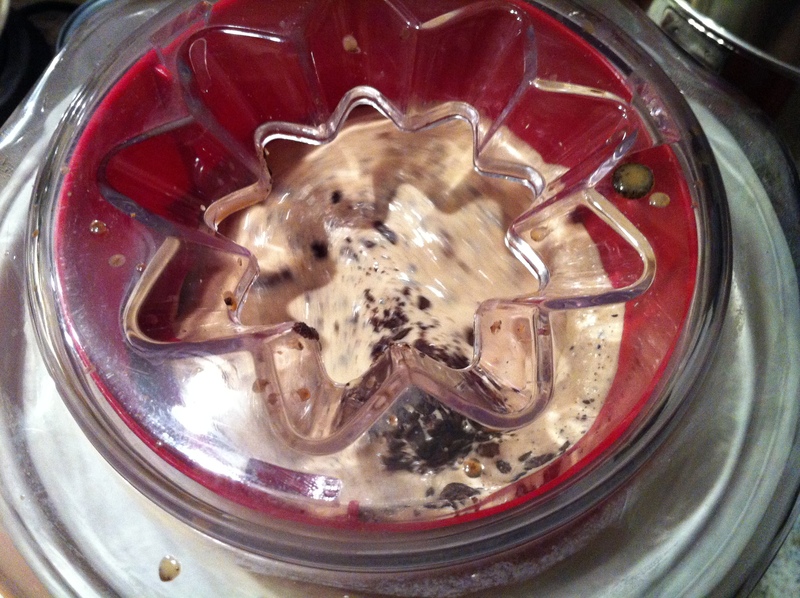 Watch them whir around a few times, then ice cream maker OFF. There is nothing more satifsying than eating freshly churned ice cream right out of the machine! Transfer the ice cream to a quart container and freeze for at least a few hours before serving. 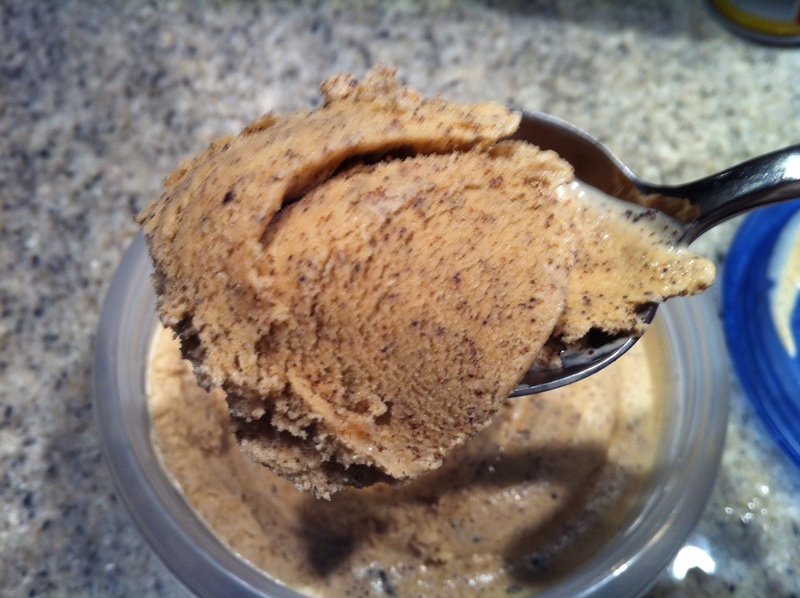 Espresso ice cream is such a lovely alternative to coffee in the morning! This entry was posted in Coffee, Eggs and tagged coffee, dessert, espresso, Ice Cream, Ina Garten. Bookmark the permalink.